You don’t worry about your oppnent being Muhammad Ali. You know you are likely going to lose if it is Ali, but you don’t fear him. Muhammad’s opponents didn’t enter the ring with their knees shaking. An opponent of Ali might know that they are going to have trouble catching him because of his amazing speed and athleticism, but there is no fear of what Ali might do to them, no fear of his Sunday punch. The same goes for Larry Holmes. No. The most feared heavyweights in boxing history are the ones to worry about, the men that truly struck terror in the heart of their opponent’s. George Foreman is one of those men. Against George however, one can always hope to survive the first few rounds and come on in the late rounds. One can hope that. It may be a false hope, but such a thought might give encouragement. George in his prime was a terror but he faded after five or six rounds. One could at least be comforted by the idea that if one can survive those early rounds there is a chance to come on to win later in the fight. Some of today’s behemoths might be under the mistaken impression that Joe Louis was “too small”, although the wise man would worry about his combined boxing skill, accuracy and shocking punching power. To a man who weighs 230-250 plus pounds he might think that such a weight advantage would aid him in surviving Louis punches. It did not help the 250 pound Buddy Baer or 260 pound Primo Carnera survive Louis bone crushing hammers, but the modern heavyweight can at least believe he is the bigger man come fight night. Mike Tyson would be wearisome to today's heavyweights, but like Foreman one could hope to take Tyson past the first few rounds and frustrate him. Keep Tyson at bay, box him, stay out of harms way the first few rounds then fight back. One would be able to enter the ring with a clear battle plan to combat Tyson. If you can discourage Tyson then you might beat him. Sonny Liston was taller than Mike Tyson at around 6’1” and he weighed 212-220 pounds in his prime. There is no question that if he were fighting today he would be about the same weight as fighters like Hasim Rahman or Oliver McCall both who were about the same height and weighed around 230 pounds. Liston’s incredible reach of 84” is 3 longer than that of Wladimir Klitschko and is tied with that of Lennox Lewis. His fists were the size of ham hocks measuring 15”. Thick, massive and menacing are the words that describe how big, powerful and intimidating a man that was Sonny Liston. Mike Tyson once stated that the one fighter in history he would least like to have met in the ring was Sonny Liston. Liston was an intimidator of intimidator’s, a man among men, and a bull among bullies. Liston was a tough guy, a killer that nobody wanted to fight. There was a good reason that Sonny Liston was feared. He was a pulverizing puncher. During his prime years between 1958 and 1963, he scored 21 straight victories with18 knockouts, 13 of those were 3 rounds or less. In one of the three bouts that lasted the distance his opponent had to climb back into the ring at the final bell to beat the count. Not only did Sonny possess crushing power, but was also a good, solid technician in the ring. Sonny could beat you inside and outside, that is a short list of great fighters who can make that claim. Liston had one of the best jabs in boxing history and was a crippling body puncher. Liston’s arms were massively muscled, and his left jab hit with true shock power. Even when off target, which it rarely was, it exploded with enough force to knock an opponent off balance so that he had to recover and set up again before he could attack. His left hook was devastating. It never occurred to Liston that he might lose a fight. He did not enter the ring hoping to outpoint his rival and knock him out only if opportunity presented itself as is the case with some fighters. His aim was destruction. He smashed you with the jab, tore your head off with the uppercut and hammered you to the canvas with his lethal left hook and looked awesome while doing it. Unlike George Foreman or Mike Tyson, Sonny didn’t get tired or frustrated after the first few rounds if his opponent’s survived his initial onslaught. Sonny had proven stamina to fight 12 hard rounds. Surviving against Sonny just meant a prolonged beating. Sonny’s reputation has suffered somewhat because of his controversial matches against Muhammad Ali. Certainly the type of fighter that gives Sonny the most trouble is the quick and clever boxer who can move and stay away as much as possible. This would not be the case with today’s lumbering giants. 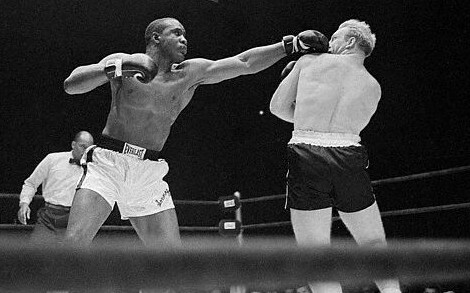 Today’s big men would be targets for Liston’s shotgun jab coming behind a reach among the best in heavyweight history. Smashing them with his jab the ever aggressive Liston moves inside and pounds the bodies of the big men with powerful lefts and rights and then switches to the head with jolting uppercuts and crushing hooks. Liston would be the invincible destroyer, annihilating his way through the heavyweight division if he were fighting today. As the modern heavyweight exits his time machine and enters the ring he sees, to his horror, none other than Sonny Liston glaring at him like a hungry lion waiting to devour his next meal. The modern heavyweight enters the ring to face the most evil stare down he has ever encountered. His knees begin to fail him. He returns to his corner unsure of himself. The bell rings. A feeling of impending dooms sickens him. Sonny Liston is coming.